The Pyramids at Giza are without doubt one of the most extraordinary sights in the world, the only surviving of the Seven Ancient Wonders of the World. Built as tombs for the pharaohs of the Old Kingdom of Egypt, they served as a necropolis for Memphis, the capital in the 3rd millennium BC, and are a testament to the brilliance of its civilisation. The first stone pyramids were built at Saqqara for the pharaoh Djoser who ruled from around 2668 BC and at Maidum by Huni, the last pharaoh of the Third Dynasty. These are the oldest step pyramids in the world. The necropolis at Dahshur to the south was used by the pharaoh Snefru who founded the Fourth Dynasty and ruled from 2613 BC. He introduced the square-based pyramid seen at Giza and built the Red Pyramid and the Rhomboid (or Bent) Pyramid. At Giza, just south of Cairo, the pyramids reached their pinnacle - the Great Pyramid of Cheops, Snefru's son, is the largest at 145 metres high with a base of 232 metres while his successors built the Pyramids of Chephren and Mycerinus. Together with the Sphinx, a lion with a human head carved from rock, they form an astonishing and must-see site. 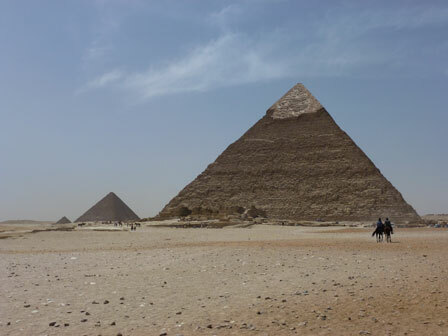 Organised group tours: Click here to see 11 tours to Nile Valley which may include The Egyptian Pyramids.